Decathletes must become proficient in logic. Remember the Honor Code always! ​Practice and competition for spots on our 2018 team have begun in earnest. We are on a mission to become masters of logic by the time the guides for this year's competition come out in October. May God bless us as we do our best to repeat last year's glory. Team practices during the season are held from 12:40-1:00 Monday, Tuesday, Thursday, and Wednesday from 12:30-1:25. when the guide is published we will also meet on Friday afternoons. Attendance is mandatory. (Friday afternoon end times range from 4:30 at the beginning of the season to 6:00 as we get closer to the event.) We will also be meeting on several Saturdays as the season progresses. Chapel Bests 100 Schools to Bring Home 2017 AJHD L. A. Championship!!! 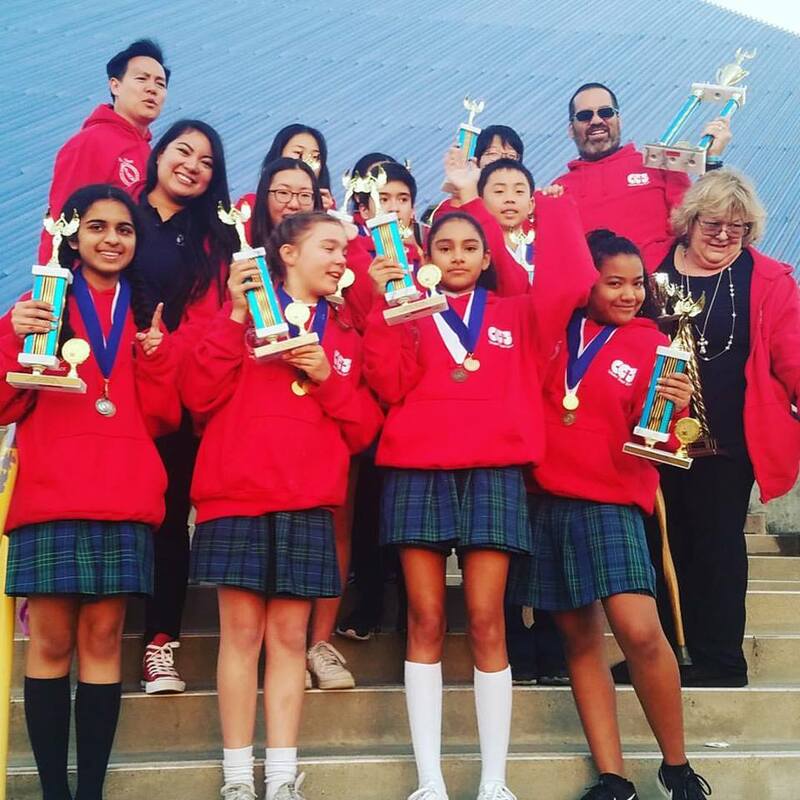 Chapel took 2nd place on Sunday, March 5, 2016 at the Walter Pyramid Center at Long Beach State University for the Los Angeles Academic Junior High Decathlon competition. The team placed 4th in the state competition. 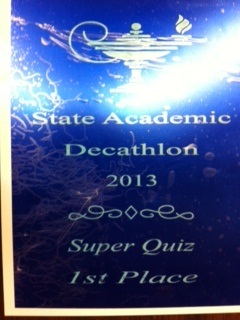 The picture to the left commemorates one of our school's proudest moments in our decathlon history. After receiving a standing ovation for their performance at the Los Angeles event, the 2013 team went on to win that event at State. Kristal Lee, a member of our 2002 AJHD State Championship team and UCI grad/valedictorian, traveled to South Korea on a Fulbright Scholarship in 2013. She and two other Fulbrighters launched a program to help underprivileged students in Gwanjiu learn English and fundamentals of global citizenship. She and her associates started NGO with sponsorship and funding from the U.S. and South Korean embassies. Upon completion of the six week program, students receive a certificate from both embassies. Students work from early morning until late at night. We could not be prouder of our Kristal and her important work. We took 2nd out of 112 schools in Los Angeles (2013) with a first in Current Events and Super Quiz. We were third overall at State with a first in Super Quiz, Math, English, and Lit. We garnered seconds in Religion and Fine Arts, thirds in Science and Current Events. We took 3rd place out of 100 schools at the 2012 Academic Junior High Decathlon- fewer than 60 points out of another 1st place win! 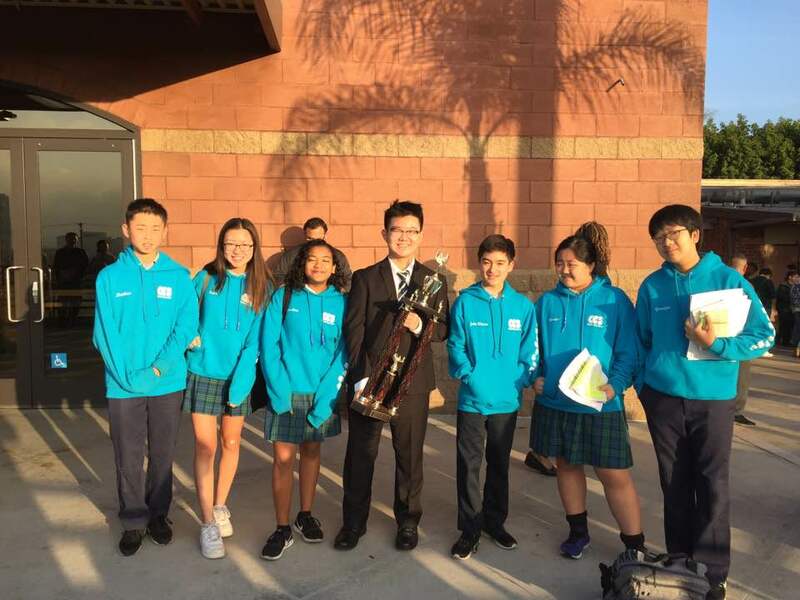 “A CCS decathlete is a junior high student of exceptional character, who maintains high marks in all classes, lives by a strict code of honor, demonstrates a willingness to sacrifice personal desires for the betterment of the team, exhibits strong school spirit, and exemplifies a profound thirst for knowledge and intense respect for education and academic achievement." 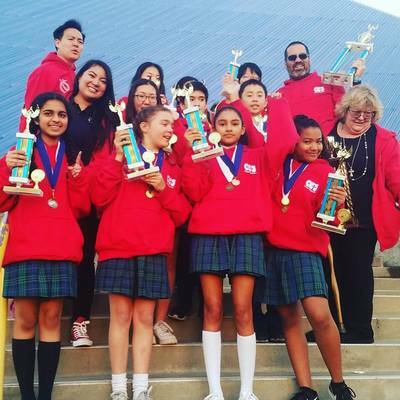 On Saturday, March 5, 2011, Cathedral Chapel School participated in the Academic Junior High Decathlon at the Los Angeles Sports Arena in Los Angeles. 104 Catholic elementary schools participated in this special event. 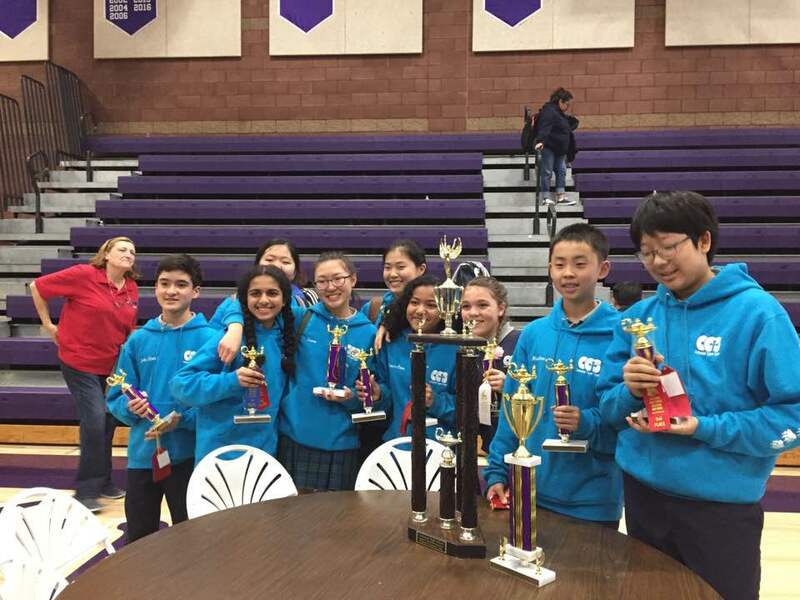 Cathedral Chapel School won SECOND PLACE with every member of the team placing in their individual events! Way to go CCS! WE DO NOT LIE, CHEAT, OR STEAL, NOR DO WE TOLERATE THOSE WHO DO. Decathletes are expected to exhibit role model behavior at all times. They must be diligent, cooperative, goal-oriented individuals who are willing to show consistent support for and dedication to the ideals of the Academic Junior High Decathlon. They must give of themselves for the good of the team. You never know what you're actually capable of until you give your absolute best.